The name "Birman" derives from the French saying "Sacre de Birmanie". In the year 1925 the Birman was recognised as an official breed in France. In breeding books you can find information going back until the year 1915. England recognised the Birman as an official breed in the year 1966 and America followed close up in the year 1967. There are several stories told about the origin of the Birman Cat. One of these stories says that Mr. Vanderbild (from the American manufacturer family) brought back two Birman Cats (male and female) from a trip in the Orient. Unfortunately, the male cat died on the trip back. But the female cat survived and was pregnant. How the breeding continued remains a secret. Another story says that in the year 1914 Major Gorden Russell was given two Birman Cats as a gift from a priest for saving them. Also these cats are told to be one of the first cats for breeding this race. According to breeding book the first Birman for breeding in Germany was the stud "Timbour de Madalapour". In the 1930s numerous Birman existed all around Germany. During World War II almost all of them vanished. After World War II the breeding of this race began from new. Up until the year 1955 France managed to secured the population of the Birman Cat. 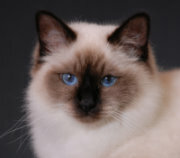 In the following year the breed in the USA and in Europe meinly concentrated on the classic colours as seal- and blue-point. However, in England they already had the colours chocolate- and lilac-point. Significantly involved for the successful outcom of the Birman Cat in Germany was Anneliese Hackmann (Cattery "von Assindia"). She adopted a female cat named "Nadine de Khlaramour" from France and brought her back home to Germany. Nadine's Kitten were adopted from all over the world. Recently the new colours red-point and creme-point found their way into this race. Today the Birman Cat can also be found in Tabby (Lynx), Tortie an Torbie.